When you are living on a budget, wasting should not be in your vocabulary! There are many areas of a budget where the "dollars" are wasted, and by doing a budget, you will be able to detect your own personal weaknesses in certain areas. We use Quicken to set our budget and can see the areas where we tend to be "always over budget." By the way you guys.... Quicken is an AWESOME way to keep track of your budget. It's easy, informative, definitely not that expensive and gives you good solid insight into your personal finances. I highly recommend it! For us, our over budget area tends to be food and that is embarrassing to say considering all the food we buy. More specifically it is our "Dining Out" dollars. We have our regular Date Night dinners out and then there are the lunches. Before my husband retired, I didn't eat out for lunch very much. Maybe once or twice a week. And then we'd go together on the weekends and treat ourselves to lunch. Having him home has been a different story. I don't mind making a sandwich or eating leftovers, but he is still adjusting to the idea of eating the majority of our lunches at home every day. So we are finding ways to trim that lunchtime budget. Today its mini pizzas and I'm going to see if I can decorate up the plate a bit so he feels like it just came out of a Pizzaria! 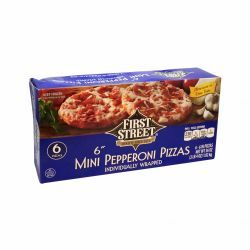 I bought 6 little mini pizzas the other day at Smart & Final for $7.99, that comes out to $1.32 per pizza or $2.64 for the two of us. I'm going to make up some lightly sweetened tea to go with it and that is going to save us BIG TIME for lunch. If I had chosen to make those pizzas from scratch and freeze them it would have been even more economical! Later this week, I'm going to make a pot of soup using up the leftovers in our fridge. This week is going to be homemade chicken noodle using some grilled chicken tenders, onions, celery, carrots herbs and spices and some homemade noodles. YUMMY! We can use it for lunch or pair it with sandwiches for a soup and sandwich night. When we go out to lunch we generally spend between $10 and $15, sometimes up to $20! And, we were going out for lunch more days than we stayed home so you can imagine how much we were spending a month. My plan is to cut that down and go out maybe twice for lunch and once for dinner a week and see how the budget changes. Set an adequate budgeted dollar amount and then don't go over it. When the money is spent, its lunches at home for the rest of the week. Hope you are having a glorious week!